Wolves entertain Man Utd again tonight, hoping for a repeat performance following the recent FA Cup Quarter Final victory, whilst United will surely be seeking revenge. Nuno Espírito Santo knows Wolves will face a tough challenge this evening and hopes the crowd will once again provide a wall of sound encouraging his team. Newly appointed Man Utd Manager Solskjaer will no doubt be looking for a victory to avenge one of only three losses under his tenure. Raul Jimenez and Matt Doherty are expected to return to the starting line-up having come on from the bench at Burnley. Ryan Bennett has served his suspension and might return to his position, although Romain Saiss won plaudits for his performance against Man Utd. Adama Traore will surely also make an appearance after the chances he created on Saturday. Tonight’s game will be screened live on Sky TV. Updates - and possibly some opinions - rather than commentary will be posted on this board and members are encouraged to post their views for the benefit of those unable to watch the game. The referee tonight is Mike Dean - who takes no prisoners!! No Rashford for Utd tonight and six changes to their team. McTominay & Fred in midfield but Lukaku up front. This looks to me like a good game for Wolves to win. Shot from Lingard in 1st 10 seconds!! United goal. Could be a difficult evening. United swarming all over us, may need a change of shape. We get our first corner & Joao puts it straight into touch!! Getting a bit of a foothold now, making it to half time without conceding again is of paramount importance. All set up for an exciting second half but we will have to come straight out of the blocks. Good first half to watch. Wolves settles and became the better team. Rui made a couple of really good saves to keep us in the game. All to play for in the second half. Two Utd defenders on yellows so will have to be careful now. Ashley young booked —- I feel a red card coming soon. And there it is red card Young. Young fouls Jota and gets a second yellow and he’s off!! It’s there for the taking now if we don’t get careless. Looks like Cav is coming on. 2-1 Wolves not sure who scored. Yippee. Smalling puts it in with his band - we’ll take that!! Concentrate lads. Come on Wolves. De Gea just stops another own goal!! Well played lads. Now for Wembley. Another great result for a fantastic season so far. A poor start but we got better as the match went on. I don't want to labour the point on Patricio, but can you imagine the reaction from here had he conceded the second goal that De gea did? That's from one of the best keepers in the wqrld… incidentally Cavs miss when it was easier to score is something that needs to be addressed in the summer but happy days anyway. Sorry I'm so late to the party - but what a great result, especially after last Saturday! Really leased with this performance! What a great performance and result. 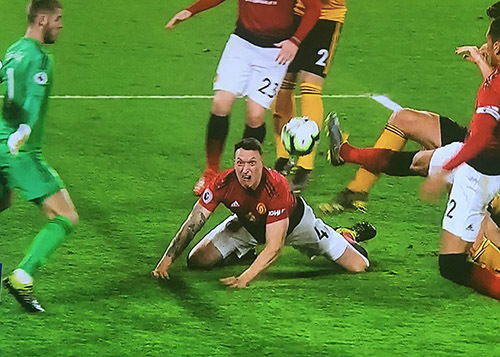 I love watching wolves pass the ball so slickly while the Man Utd players run around like headless chickens. Also Patricio had a great game. Ole gunner has his work cut out with games v Everton Chelsea and Man city coming up. Well done wolves, so proud. Another great result. All played well especially Patricio with some great saves, Boly was immense, Vinagre fantastic and what a future he could have, Jota brilliant all night and as for Moutinho, he must be the signing of the season for £5m. One strange thing. I had a supporter sitting behind me in the North Bank and I was earwigging his conversation at half-time and I heard him say he was from Devon and didn't get to matches as often as he liked. At full time I asked if he was from Ivybridge by any chance and he said that he was. I saw on another thread that Ivy said he was going. What a coincidence? Sitting right behind me. I shook hands and introduced myself but this chap had never heard of me or The Molineux Way. What are the chances? Andy - was it a chap in camouflaged cap with a West Country accent? If so, it’s my mate. I think he was in row AA - or summat like that. We go down the pub and watch us play on telly and often travel up together but not yesterday. I was in row M with another friend of mine. A really slow journey home last night - got home at 2.40am. All worth it, it was a great match, so enjoyable. Thought we were going to get rolled over in the first 20 before we took control. Thought Moutinho was absolutely immense but hard to single out in such a brilliant team performance. As suggested, 3 excellent saves from Rui. No doubt about it, he kept us in it. It could have been 0-3 after 20 mins, equally it could have been 4-1 to us at FT. How on earth did Cav miss - was he Costa in disguise? LOL. Manchester United ..... can we play you every week!!?? Ivy, that sounds like him. He was wearing a cap, I didn't notice if it was camouflaged or not (probably because it was camouflaged) and I was in row Z so AA sounds about right. Seemed like a nice chap. Yep, that’s him - Chesh also met him when we met up for the West Ham match. As said, he’s one of the 6-8 regular Wolves fans in our Ivybridge pub group. Very nice chap. Small world! We had a swift pint in the Combermere pre-match. Good pub. Surely the only pub with a massive tree stump in the gents - class.